Enabled by increasingly liberal policy frameworks, made possible by technological advances, and driven by competition, globalization more and more shapes today’s world economy. Foreign direct investment (FDI) by transnational corporations (TNCs) now plays a major role in linking many national economies, building an integrated international production system — the productive core of the globalizing world economy. Transnational corporations deploy their tangible and intangible assets (capital, research-and-development capacity and technology, organizational and managerial practices, trade links), with a view towards increasing their competitiveness and profitability. At the same time, the deployment of these assets by firms strengthens the resource base of countries and their capacity to produce, to reach and expand markets for their products and to restructure their economies — in brief, to improve their overall economic performance. To link the increased competitiveness of TNCs to the economic performance of host and home countries as closely as possible poses a challenge for policy makers. These developments and issues are the particular theme of the World Investment Report 1995. Part One of the World Investment Report 1995 examines recent global and regional trends in FDI, with a special emphasis on the emergence of TNCs from developing countries and on changing forms of international transactions. Part Two focuses on the role of TNCs in influencing countries’ access to resources and markets and in facilitating economic restructuring. Part Three discusses policy issues, from an inward and outward FDI perspective. The annex contains statistics on FDI trends. International production by TNCs — now some 40,000 parent firms and some 250,000 foreign affiliates — increasingly influences the size and nature of cross-border transactions. In the process, it shapes the nature of the world economy. 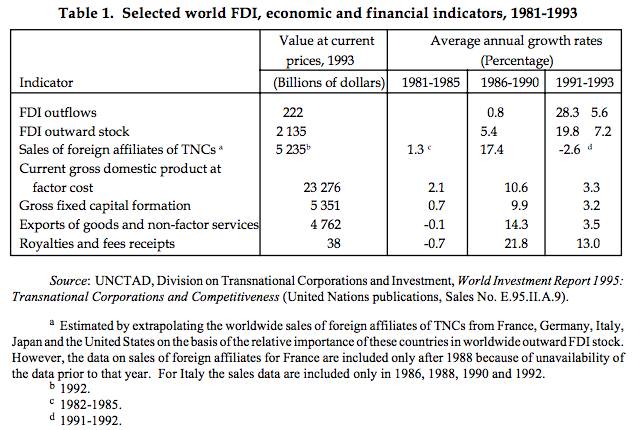 Outward FDI stock and global sales of foreign affiliates — two generally accepted proxy indicators of international production — now stand at $2.6 trillion (1995) and $5.2 trillion (1992), respectively (see table 1). 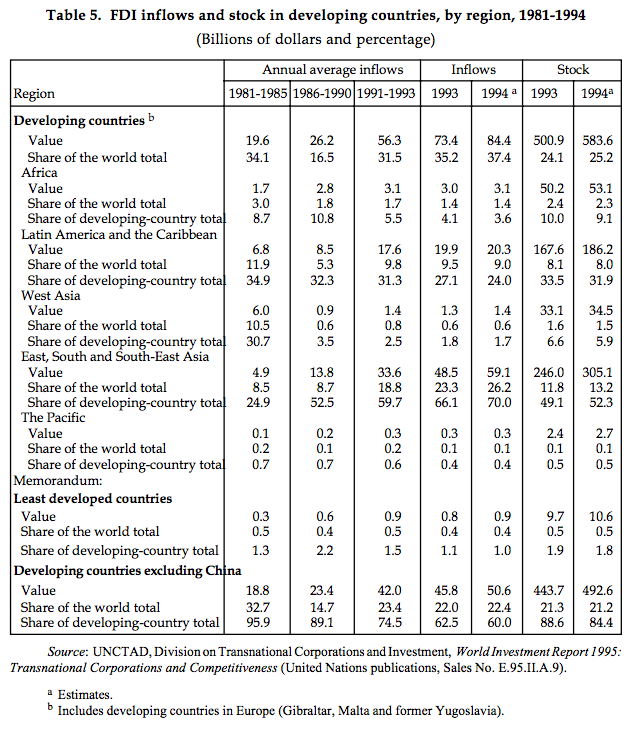 In the 1990s, the rate of growth of FDI stock has substantially exceeded that of world output (GDP) and world exports. The size and scope of international production are amplified further by the activities of TNCs in forms other than FDI, such as subcontracting, licensing and franchising, through which markets for goods, services and factors of production can be reached and international production organized. Global sales in international markets associated with this more broadly defined international production amounted to an estimated $7 trillion in 1992, compared to some $3 trillion in arm’s length trade. In fact, in the case of TNCs headquartered in the United States, four out of five dollars received for goods and services sold abroad by these firms are actually earned for goods and services produced by their foreign affiliates or sold to them. The various forms of international production may be substitutes or complements for each other, depending on the strategies of TNCs. All of them are aimed at ensuring access both to markets for goods and services and to markets for tangible and intangible factors of production, in a quest to convert globally inputs into outputs for global markets as efficiently and profitably as possible. The diverse nature of international production suggests that international policy discussions about market access have to deal not only — as they currently do — with trade in goods and services but also with FDI as a modality to access markets. Beyond that, FDI is also a modality to access factors of production. Such a broader perspective also raises the question as to the extent to which specific government policies may introduce a bias in favour or against any specific modality of international transactions and, therefore, distort the way in which firms undertake and organize their international activities. The importance of such distortions would become clearer if governments paid greater attention to the interrelationships between investment, trade and other forms of international transactions in their dual function of accessing markets for goods, services and factors of production and organizing international production. Partly in response to globalization, progress in coming to grips with the nature of international production is already being made. National, regional and international agreements are paying more attention to FDI. Although for a number of countries there is still an imbalance between the degree of liberalization of FDI and trade regimes (with progress achieved for the latter, furthermore, bound in multilateral agreements), FDI regimes at the national level are rapidly being liberalized: continuing a trend of earlier years, 101 out of 102 legislative changes made in 1993 in 57 countries were in the direction of a more liberal FDI framework; in 1994, 108 out of 110 legislative changes made in 49 countries were in the same direction. In fact, only 5 out of a total of 373 FDI regulatory changes during 1991-1994 were not in the direction of greater liberalization (table 2). Such unilateral measures have been accompanied by the conclusion of bilateral investment agreements, primarily between developed and developing countries, but increasingly also among developing countries. Of the more than 900 treaties that existed by mid-1995 between 150 countries, nearly 60 per cent date from the period since the beginning of 1990, 299 from 1994 alone. Another dimension has been added to the liberalization process at the regional level, with the strengthening of free trade agreements which, increasingly, also liberalize FDI flows (and, therefore, properly ought to be called free trade and investment agreements). In fact, the OECD countries began negotiations in September 1995 on a Multilateral Agreement on Investment, with a view to reaching such an Agreement by May 1997 as a free-standing treaty open also to non-OECD countries. Finally, a proposal has been made to negotiate an investment agreement in the World Trade Organization. All this means that the enabling framework for FDI is being strengthened, thus giving further impetus to the process of globalization. International production, as reflected by the FDI stock accumulated by TNCs, has been growing at a rapid pace since the early 1980s, a growth that only briefly slackened during the FDI recession of the early 1990s. 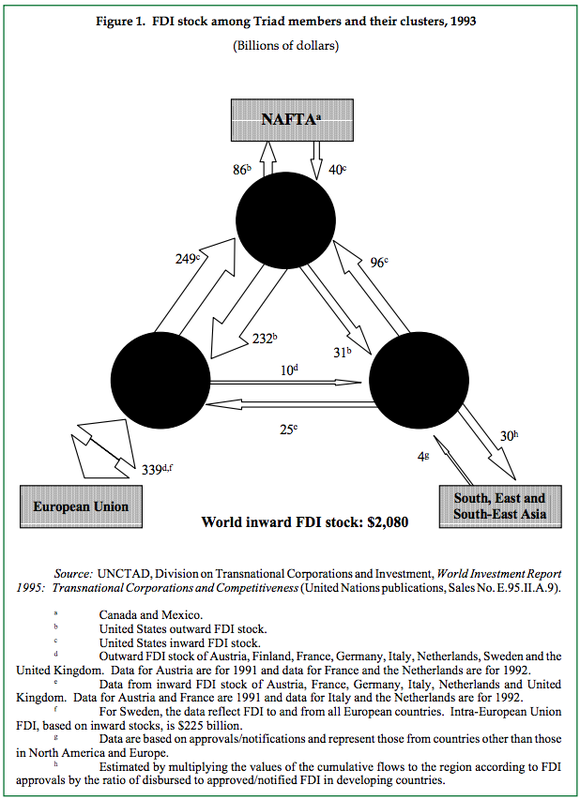 Investment stocks and flows remain concentrated primarily in the developed world and particularly in the Triad (the European Union, Japan and the United States), both as far as their origin and destination are concerned (see figure 1). This distribution of inward FDI stock mirrors market size, with the developing countries accounting for between one-fifth and one-quarter of both world GDP and global inward FDI stock. However, the FDI stock in developing countries is highly concentrated: the 10 largest developing host countries account for about twothirds of the total stock in developing countries, more than would be expected from their share in developing country output or trade. As far as outward stock is concerned, firms from developing countries generated only 6 per cent of the world FDI stock in 1994, reflecting the superior competitiveness of Triad firms, based on their ownership-specific advantages. As with inward investment, the outward developing country FDI stock is largely accounted for by firms from only a handful of developing countries. As far as FDI flows are concerned, the share of developing countries in world inflows is now higher than their share in world imports (about 30 per cent in the early 1990s). The volume of FDI flows reflects the strength of countries’ current locational advantages for inflows and the strength of firms’ current ownership-specific advantages for outflows. In terms of FDI outflows, the developing-country share is about a half of their share in world exports. If the value of sales associated with inward FDI is compared with the value of imports, this suggests that, for developing countries as a group, inward FDI rivals imports when it comes to obtaining what they need from the rest of the world, while they still rely much more on exports than on outward FDI when it comes to delivering goods and services to foreign markets. The implication is that, although developing countries are becoming more fully integrated into the world economy through inward FDI, this integration is asymmetric and does not yet apply to outward FDI. There are, however, significant differences in the experiences of various groups of developing countries (see below). By the end of 1993, FDI outflows had largely recovered from the FDI recession (reaching $222 billion) and, in 1994, maintained this level. Preliminary estimates for 1995 ($230 billion) suggest that the recovery has been further consolidated. The recovery is partly a cyclical phenomenon: as the major home countries came out of a period of recession, their firms embarked upon expansion plans that included investing abroad. Over and above this cyclical movement are structural factors — in particular the pressures of growing international competition, coupled with advances in communications technology that allow better coordination of cross-border activities — which make it essential for firms to invest abroad in order to be competitive internationally. Furthermore, the liberalization of the regulatory frameworks for FDI, trade and technology and the privatization of state-owned enterprises create additional opportunities for foreign investors. The recovery of FDI flows has been due primarily to an increase in FDI activity by firms from developed countries. A repositioning took place among the top five home countries, together accounting for nearly 70 per cent of global outflows, with the United States reasserting its lead once more as the principal home economy for FDI, accounting (with $610 billion) for a quarter of the world’s stock and (with $46 billion) one-fifth of world outflows in 1994 (table 3). The vigorous FDI expansion experienced by the United States has not been matched by other Triad members. Although Japan’s outward investment rose by nearly one-third (to $18 billion) in 1994, it remained way below earlier peaks ($48 billion in 1990). As economic growth in France, Germany and the United Kingdom resumed or gathered momentum, TNCs based in those countries again became more active abroad. Most of this activity remained concentrated in the Triad. Out of an estimated $235 billion of world inflows in 1995, inflows to developed countries as a group are projected to be $138 billion, compared to $129 billion in 1993 and $135 billion in 1994. The United States resumed its position as the single largest FDI recipient ($49 billion in 1994), while flows to Japan remained negligible (with less than $900 million in 1994, about the same order of magnitude as flows to the Czech Republic). Although Western Europe continues to be the largest FDI recipient, a number of countries in the region (such as the Netherlands and the United Kingdom) have not yet emerged from the FDI recession. The region’s recovery in terms of inflows has been slower than its recovery in terms of outflows, reflecting partly the more dynamic performance of other parts of the world. While outward FDI flows from European countries have regained their momentum, South, East and South-East Asia — the most dynamic region in the world — continues to be neglected by them as a host region. Perhaps preoccupied with regional integration, European Union firms have only some 4 per cent of their stock and about 3 per cent of their flows directed to this region. The region’s share of European Union exports is not much larger, about 5 per cent. Japanese TNCs have invested four times more in this region, and United States TNCs two-to-three times more than their European Union competitors. Country level data illustrate this further: for instance, Germany’s FDI stock in developing Asia (excluding West Asia) is about half the size of her stock in Spain, and Germany’s flows to that region during 1990-1993 were less than Germany’s flows to Austria. In the case of the United Kingdom, the country’s FDI stock in developing Asia is about the same as in Australia, while flows are about the size of flows to Sweden. However, there are signs that European Union firms are changing course, as reflected in their increasing outflows to Asia. With South, East and South-East Asia being the fastest growing region in the world, FDI competition there is set to intensify, both in terms of countries seeking to attract FDI and in terms of TNCs competing for investment opportunities. Firms from the region itself have actually acquired a leadership role in this competition. In spite of the renewed attractiveness of the developed countries, developing countries have succeeded in attracting growing investment flows, reaching $84 billion in 1994 to account for 37 per cent of world FDI inflows (table 4). This is a continuation of a trend that began in 1990 and has propelled developing countries to become a major force in world FDI. (If intra-European Union flows are excluded, the share of the developing countries in world FDI flows rises from 35 per cent in 1993 to 44 per cent in 1994.) To a large extent, the successive annual increments to FDI flows into these economies reflect the growing attractiveness of a single country, China. With some $34 billion in inflows, China was the second largest recipient of FDI flows worldwide in 1994, accounting for some 40 per cent of all flows into developing economies. But, even if China is excluded, FDI flows into developing countries registered an increase of 11 per cent in 1994 (from $46 billion to $51 billion). The year 1995 may well register another increase, both for China and all other developing countries as a group, to reach an estimated total of $90 billion. A notable aspect of the increase in FDI inflows into the developing world is that, since 1990, these flows have become the largest and fastest growing single component of external finance for this group of countries, taken together. More specifically, FDI flows accounted for 7 per cent of domestic fixed capital formation in 1993 and have been larger than official development assistance flows since 1992 for the developing world as a whole. They were also larger than other private flows in some years during the late 1980s and early 1990s. Indeed, for 30 developing economies and four economies in Central and Eastern Europe, FDI inflows in 1993 represented the single largest component of all net external resource flows. The number increases to 81 developing economies and seven economies in Central and Eastern Europe, if only private net external resource flows are considered. The dominant role of FDI flows is not only important because of the productive assets associated with them, but also because of their greater resilience, as compared with portfolio equity investments, to adverse economic shocks and currency depreciations, reflecting the fundamental differences in motivation between these two types of external finance. Driven by its relatively fast economic growth, the Asia-Pacific region as a whole remains the most important host region among developing countries, with some $61 billion in inflows in 1994. That region now accounts for more than 70 per cent of the total developing-country FDI stock. Within Asia, countries have performed unevenly in attracting FDI: China and East and South-East Asia are at the forefront, while the Pacific island economies and some of the South Asian countries are still lagging behind. China remains the largest recipient in Asia, even if allowance is made for the fact that an overvaluation of FDI inflows may have inflated the magnitude of inflows by one-quarter. Moreover, the country is now becoming more cautious in terms of appraising FDI projects and more careful in terms of monitoring the fulfillment of contractual FDI commitments. At the same time, China is more selective in terms of the type of FDI that it seeks, and it encourages a greater geographic dispersion of these investments within China.The success of China in attracting FDI flows has raised the issue of the extent to which this accomplishment has been achieved at the expense of other countries in the region. With the possible exception of export-oriented FDI, there is no evidence suggesting that this has indeed been the case. Profitable opportunities for market-seeking investments abound in other countries in Asia, notably, India, Indonesia, Malaysia and Thailand; such investments are unlikely to have shifted among countries with the emergence of China. Similarly, resource-seeking FDI is location-bound and not likely to be mobile. Hence, only a small part of the FDI attracted by China is likely to have relocated there from other economies in Asia in response to cost and productivity considerations. Indeed, FDI flows into ASEAN have started to grow again since 1994. And India is beginning to attract significant amounts of investment and is likely to attract considerably more if it sustains its liberalization policy. West Asia is still neither a major recipient nor source of FDI, although the prospective success of the Arab-Israeli peace process could boost economic growth and open up new investment opportunities. Inward FDI growth in Latin America and the Caribbean appears fragile, depending very much on privatization programmes. Flows into Latin America and the Caribbean increased only marginally in 1994, to some $20 billion, largely shaped by privatization programmes open to foreign investors. The region’s resumed economic growth and liberalization of trade and investment regimes are factors that improve prospects for sustained FDI inflows. Experiences across countries vary considerably. Argentina, which was the largest recipient among Latin American countries in 1993 with some $6 billion in inflows, largely as a result of the implementation of its privatization programme, experienced a sharp decline in 1994 (to some $1.2 billion). Other countries, notably Peru, with some $2.7 billion (also very much related to privatization), and Chile, with some $1.8 billion, experienced a sharp upswing in FDI inflows in 1994.The implementation of MERCOSUR and the possible enlargement of NAFTA may become important factors for the configuration of FDI inflows within the region. The devaluation of the Mexican peso at the end of 1994 and the beginning of 1995 has had a mixed effect on FDI flows (see box 1). 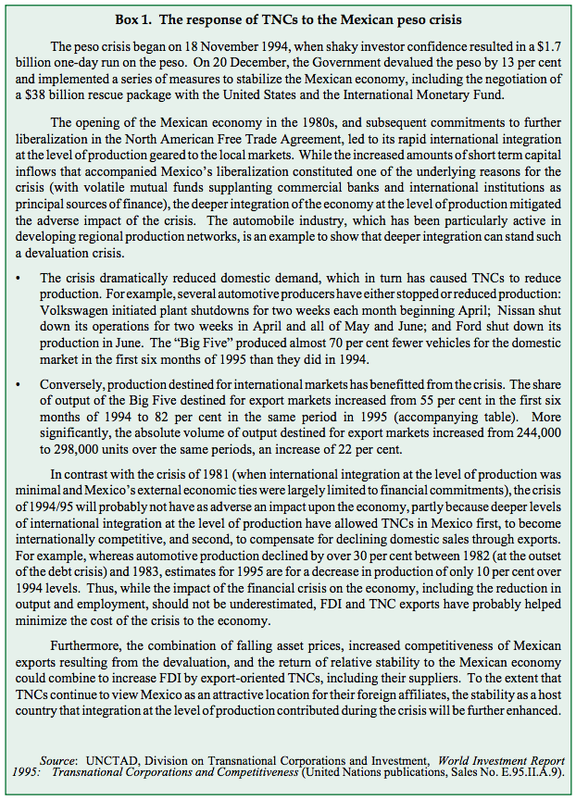 On the one hand, it has created new opportunities for export-oriented investment and lowered the cost in foreign currency of purchasing domestic assets; this is likely to boost FDI in Mexico by United States and Canadian TNCs seeking to establish or deepen regional production networks in response to NAFTA, and by non-NAFTA TNCs interested in penetrating the NAFTA market. On thehowever, domestic market-seeking investments are suffering from the recession.It is still too early to assess how these two sets of effects will work themselves out, although it is clear that FDI flows have been less affected by the crisis than portfolio flows. Although FDI inflows to Mexico during the first half of 1995 fell to an estimated $2.6 billion from the level ($3.5 billion) reached in the first half of 1994 — a drop that can be partly explained by the peso crisis and partly by a post-NAFTA effect (similar to the initial rise and the subsequent drop of FDI flows into the European Union after the implementation of the Single Market programme) — they nevertheless exceeded the levels reached in the first six months of 1992 and 1993 ($2.2 billion and $2.1 billion, respectively). In contrast to Mexico, where rapid FDI-led integration with North America since the mid- 1980s had preceded the NAFTA negotiations, the other countries in Latin America and the Caribbean are advancing at a much slower pace as far as such integration is concerned. There are, however, some recent indications that this process is gaining momentum, especially in the case of Chile. Given the already substantial FDI stock in Latin America and the Caribbean accounted for by United States and Canadian TNCs, and the intra-firm trade flows associated with it, the region holds considerable potential for becoming more closely linked to the North American production system and benefiting from the growth it stimulates.negative side, however, domestic market-seeking investments are suffering from the recession. It is still too early to assess how these two sets of effects will work themselves out, although it is clear that FDI flows have been less affected by the crisis than portfolio flows.Although FDI inflows to Mexico during the first half of 1995 fell to an estimated $2.6 billion from the level ($3.5 billion) reached in the first half of 1994 — a drop that can be partly explained by the peso crisis and partly by a post-NAFTA effect (similar to the initial rise and the subsequent drop of FDI flows into the European Union after the implementation of the Single Market programme) — they nevertheless exceeded the levels reached in the first six months of 1992 and 1993 ($2.2 billion and $2.1 billion, respectively). In contrast to Mexico, where rapid FDI-led integration with North America since the mid- 1980s had preceded the NAFTA negotiations, the other countries in Latin America and the Caribbean are advancing at a much slower pace as far as such integration is concerned. There are, however, some recent indications that this process is gaining momentum, especially in the case of Chile. Given the already substantial FDI stock in Latin America and the Caribbean accounted for by United States and Canadian TNCs, and the intra-firm trade flows associated with it, the region holds considerable potential for becoming more closely linked to the North American production system and benefiting from the growth it stimulates. Africa remains marginalized. The FDI boom in developing countries has largely bypassed that continent. Sub-Saharan Africa received FDI flows worth $1.8 billion in 1994 (the size of flows to New Zealand), while North Africa received $1.3 billion (comparable to flows to Portugal). Most FDI in Africa continues to be concentrated in a small number of countries endowed with natural resources, especially oil. In spite of these small investment flows, it is not correct to perceive Africa as a region with poor investment opportunities. The heterogeneity of the region disguises significant differences in FDI performance and potential. It includes a number of countries that do well in terms of attracting FDI, even when compared to the average for all developing countries.Furthermore, key determinants of FDI location, such as the level of development, market size and market growth, suggest that unexploited FDI potential exists in a number of countries. Indeed, an analysis based on the performance of United States affiliates since the early 1980s reveals that profitability in Africa is higher than in certain other developing country areas. Most governments have made considerable progress in undertaking farreaching domestic policy reforms and improving substantially their regulatory frameworks, especially regarding FDI. But more needs to be done to tap the existing FDI potential. Well implemented privatization programmes, for example, could be of help here, and in some countries (e.g., Egypt and Morocco) progress is being made in this respect. This underlines further the need to differentiate when considering investment opportunities in Africa. … with the countries of Central and Eastern Europe being drawn into the international production system as well. The countries of Central and Eastern Europe are not yet major players as regards FDI inflows and outflows. In 1994, total inflows into the region, at $6 billion, were lower than inflows to Singapore alone, and the region’s cumulative stock (of some $20 billion) was comparable to that of Argentina. Furthermore, inflows remain concentrated in a handful of countries (the Czech Republic, Hungary and Poland) in which privatizations have been an important factor. Elsewhere, FDI flows are lagging behind recovery. Foreign affiliates contribute to the process of transformation, especially in terms of their above-average performance as regards productivity and exports, the provision of specialized services and the stimulation of competition. With more countries creating functioning markets and emerging from the transitional recession, they are likely to attract more FDI. However, care will need to be taken that such factors as excessive expectations, the negative side-effects of privatization and restructuring (such as lay-offs) and sovereignty sensibilities do not lead to a backlash against FDI. About one-third of the total assets of the world’s 100 largest TNCs, as ranked by UNCTAD on the basis of the value of their foreign assets, are located abroad. It is estimated that these TNCs account for one-sixth of world outward FDI stock. Royal Dutch Shell, the biggest of these firms, operates in petroleum extraction and processing activities, but firms in new information industries, such as IBM and General Electric, have been moving up the ladder. 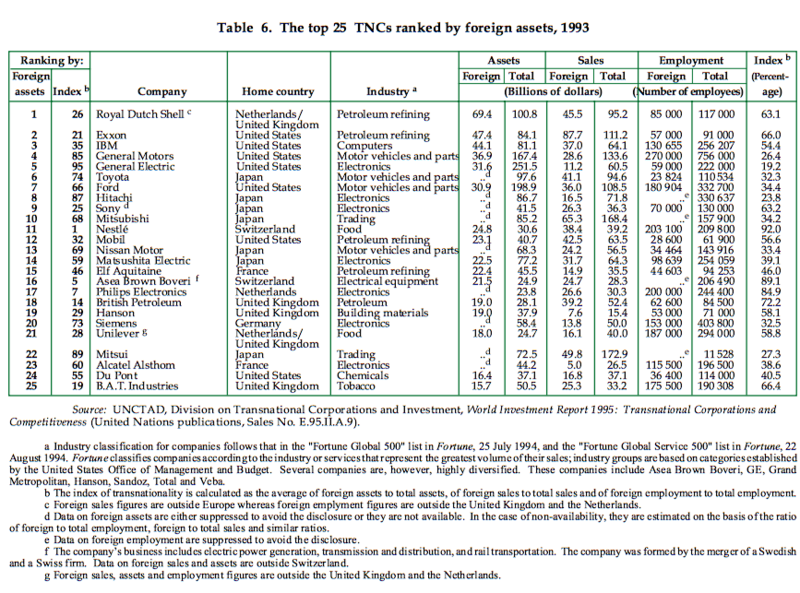 Ranking firms by foreign assets is important as it captures the absolute impact that individual TNCs can have on host countries (see table 6; and figure 2). But it does not say anything about either the extent of their transnationalization or about the strategies firms pursue, and especially the role they assign to the various units (including foreign affiliates) that comprise a transnational corporate system. 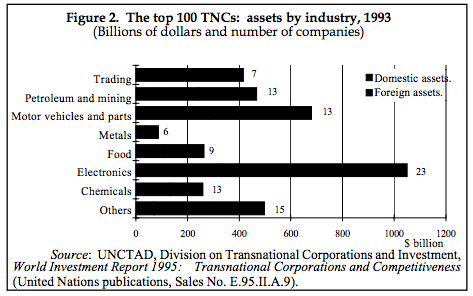 Arranging the top 100 TNCs on the basis of UNCTAD’s new composite index of transnationality (that takes into account the respective shares of foreign assets, foreign sales and foreign employment in the corresponding totals but does not, of course, capture corporate strategies and the role of the individual units comprising a TNC system) yields a ranking that gives Nestlé the top position, followed by Holderbank and Thompson Corporation. According to UNCTAD’s transnationality index, 40 out of the top 100 TNCs have more than half of their activities abroad, with the average share for the group as a whole being 41 per cent. The index also shows important differences by industry, with chemicals (61 per cent) and food (53 per cent) scoring highest on the transnationality index, and trading the lowest (30 per cent). The index also reveals — not surprisingly — that TNCs from small economies such as Belgium and Switzerland have a strikingly larger proportion of their activities abroad than TNCs from large countries such as Japan or the United States. But even in the case of United States firms among the top 100 TNCs, the transnationalization index reaches an average of 34 per cent. The universe of TNCs comprises not only large companies. Increasingly, it also includes small and medium-sized firms (i.e., firms with less than 500 employees in their home countries), each of which contributes to the integration of the world economy. UNCTAD’s sample of 50 small and medium-sized enterprises from developed countries suggests that these firms can be quite international. Their transnationality index is 27 per cent, with 13 of them scoring over 40 per cent (6 of which even exceeded 50 per cent). In this sample, firms tended to be more transnationalized in terms of employment (44 per cent) than in terms of assets (28 per cent) and sales (26 per cent), pointing to the larger importance of labour-intensive activities for smaller firms — and hence the benefits of seeking out low labour costs abroad. … more and more firms from developing countries are entering the ranks of outward investors. The globalization process extends, of course, to firms from the developing world as well. 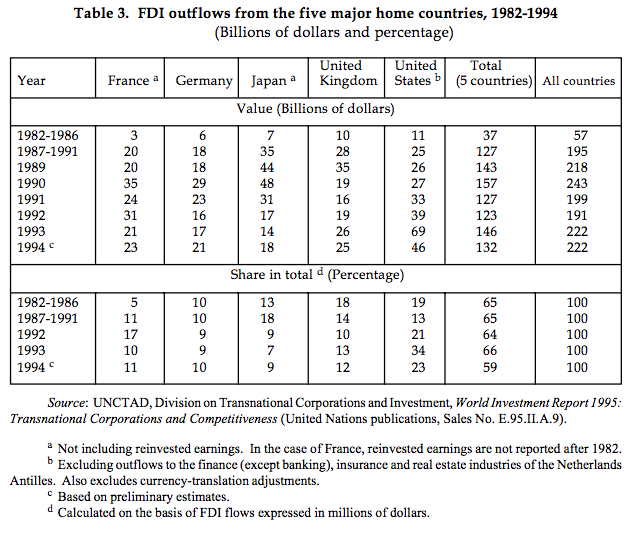 While small in the global context, FDI outflows from developing countries as a share of world flows have doubled in importance from 5 per cent in 1980-1984 to 10 per cent in 1990-1994. 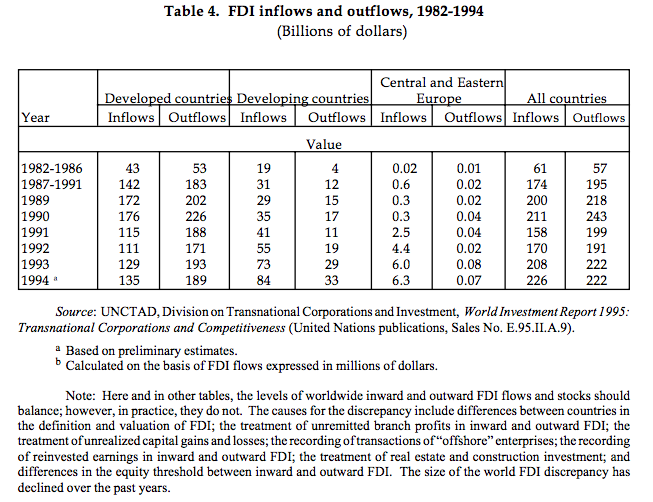 In 1994, in fact, 15 per cent (or $33 billion) of world FDI outflows originated in developing countries. Most investments originate from a small number of newly industrializing economies in Asia (and Latin America). Although a growing share is directed to developed countries, most outflows take place in a regional context within Asia and Latin America. Regional flows are increasingly important, especially in Asia: in nine important Asian developing economies, the share in total inward FDI stock accounted for by the same economies rose from 25 per cent in 1980 to 37 per cent in 1993. Not surprisingly, TNCs from Asia dominate (with 32 entries) the first-ever list compiled of the 50 largest TNCs from developing countries (ranked by the size of their foreign assets), with the remainder being based in Latin America (see table 7). Asian firms also capture the top seven rankings in terms of transnationality, which reflects the fact that Asian TNCs as a group are more transnationalized (16 per cent) than Latin American TNCs (12 per cent). Although five firms have more than 40 per cent of their activities abroad, TNCs from developing countries as a group, scoring 13 per cent on the transnationality index, are considerably less transnationalized than their developed country counterparts — an indication that the transnationalization process for these firms is only just beginning. Indicative of this is also the fact that the foreign assets of the leading developing country TNC (Cemex S.A. from Mexico) are barely as large as those of the last firm on the list of the world’s top 100 TNCs (R.J.R. Nabisco from the United States). Overview International production by TNCs is boosted by the continuing recovery from the FDI recession ... ... in the developed countries (led by the United States) ... ... and the enduring growth of FDI flows to developing countries, ... ... with the countries of Central and Eastern Europe being drawn into the international production system as well. As the world’s top 100 TNCs are becoming more transnationalized ... ... more and more firms from developing countries are entering the ranks of outward investors.